Blue Bell, Pa.—The Montgomery County Economic Development Corporation (MCEDC) presented a check today for $ 2 million to Montgomery County Community College (MCCC), the largest private gift ever given to the College. The $2 million gift will establish an endowment within the College’s Foundation. Annual interest from the endowment will fund workforce development programs and scholarships for students pursuing high-demand industries that support the continued prosperity of the County and its citizens. The gift comes as the result of an April 24, 2014 vote by the MCEDC Board of Trustees to dissolve the private, independent nonprofit organization and distribute some of its assets to the Montgomery County Development Corporation (MCDC) and the College to create efficiency in the administration of the County’s economic development programs. The selection of the College as a recipient of these funds reflects the College’s strong relationships with the County and business community as well as its past success in workforce development. MCEDC has requested that the College leverage its gift by raising an additional $2 million in matching funds. Stipends for books, transportation, and childcare for veterans pursuing their education in high-demand or STEM fields, or for use of the College’s Center for Entrepreneurial Studies incubator to start a business. To address the nearly $20 million in unmet student financial needs, the College launched the $9 million Futures Rising Campaign in November, during its 50th Anniversary year. This first-ever comprehensive campaign is designed to support student success, beginning with scholarships that broaden access to this education. 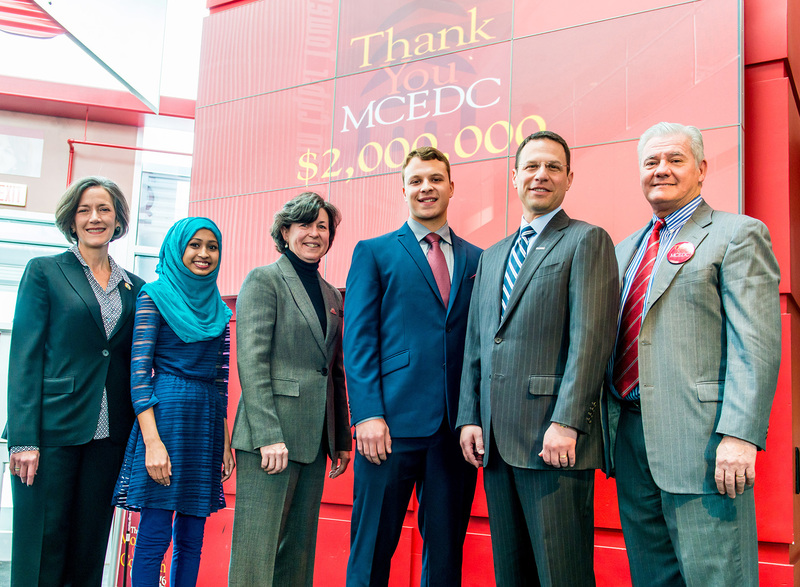 The MCEDC gift is the largest the Campaign has received. The gift recognizes the longstanding productive relationship between the County and the College and their joint ability to align training to business needs. One of only 50 institutions in the nation to offer training through the Global Corporate College international network, MCCC’s Center for Workforce Development partners with dozens of businesses annually to provide training. The College recently added a Pennsylvania Real Estate Pre-licensing Fast Track Program and a Medical Office Assistant course, in addition to new certificate programs in Fall 2014 in the high-demand occupations of Biotechnology/ Biomanufacturing, Cloud Computing, Cyber Security, and an expanded Dental certificate. Currently under development are training programs for Physical and Occupational Therapy Assistants. Since its founding in 1964, Montgomery County Community College has grown with the community to meet the evolving educational and workforce development needs of Montgomery County. The College’s comprehensive curriculum includes 100+ associate degree/certificate programs, as well as specialized workforce development training and certifications. Students enjoy the flexibility of learning at the College’s thriving campuses in Blue Bell and Pottstown, online through an extensive array of e-Learning options, and at the Culinary Arts Institute in Lansdale. The College also offers first-responder training programs at the Public Safety Training Campus in Conshohocken. Supporting its mission to offer high-quality, affordable and accessible educational opportunities, the College is funded by the County, the State, student tuition and private contributions. Governed by a 15-person Board of Trustees appointed by the Montgomery County Commissioners, the College is fully accredited by the Commission of Higher Education of the Middle States Association of Colleges and Secondary Schools.